The Cupertino-based technology giant has finally revealed the much awaited new iPad at its media event held on Wednesday in Sans Francisco. This is certainly company’s second big launch after it announced iPhone 4S back in October 2011. The new device features much anticipated 9.7-inch retina display and support for 4G LTE networks. You might be wondering about the name of the device, so to calm your nerves down, the company didn’t use anything but the new iPad phrase for the device. The device was announced by Apple’s CEO Tim Cook who took stage to open the event at the Yerba Buena Center for the Arts in Sans Francisco. The same platform is used to announce the previous two generations of iPad as well. 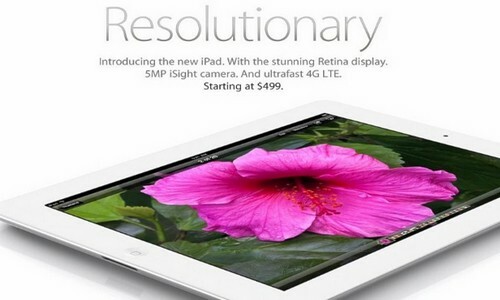 The new iPad sports a retina display, with 2048 × 1536 pixels (264 pixels in each inch). The device has a massive 1 million more pixels than HDTV. Also, the new iPad has 44% greater saturation. The device sports A5X quad-core graphics. It has a 5-megapixel camera having same optics sensor used in iPhone 4S and ability to capture 1080p video. The new device will make debut on March 16 in countries – including US, UK, Japan, Canada, Switzerland, Germany, France, Hong Kong, Singapore and Australia. The device will be offered both in white and black finishes. The device offers 10 hours of battery life on normal use, while 9 hours on 4G. It has a weight of around 1.4 lbs and thickness of 9.4 mm. The device is available for pre-orders straight-away. The cost for Wi-Fi only iPads are: $499 for 16GB, $599 for 32GB and $699 for 64GB, while 4G models will be available for: $629 for 16GB, $729 for 32GB and $829 for 64GB. On the other hand, the second generation iPad 2 will be sold for $399 for Wi-Fi and $529 for both 3G and Wi-Fi.